This is not for the soft hearted by any means. Today is for the rough, rugged and crunchy. That’s right folks — October 4 is National Crunchy Taco Day — the most talked about event since the reveal of Michaelangelo’s “David” sculpture. Celebrate with us. We know, you saw that one coming. What better way to celebrate? Invite your friends over for a night of cooking tacos from scratch. Ask your best pals to break out their family recipes and join you for a night of fun. Dice up those tomatoes, open your cans of cerveza, and have an amazing dinner with your closest compadres. As you've suspected, this day is the equivalent of Christmas Eve. Celebrate by gifting a pair of perfectly crunchy tacos to your family, friends or coworkers. You won't need a gift receipt, we swear. Take this opportunity to explore new restaurants for the first time. Maybe that place you pass by on your way home from the gym, or that taco spot you read about on Thrillist.com. have fun with it! Invite your crush to dinner and order a variety of tacos. Have fun! According to recent studies, tacos contain 21% protein, 24% carbs and 12% fat, versus a Fiber bar's 15% of protein, 7% of carbs and 18% of fat. Orale! We live in a world full of tortilla-based foods like quesadillas, burritos, tortilla soup, and enchiladas. What about the deliciously-crafted-crunchy-shell tacos? It is time to give credit, where credit is due. After all, if St. Valentine got his own day, there should definitely be at least 24 hours for the legends known as crunchy tacos. Do we really need a third reason? Let me paint a picture for you. 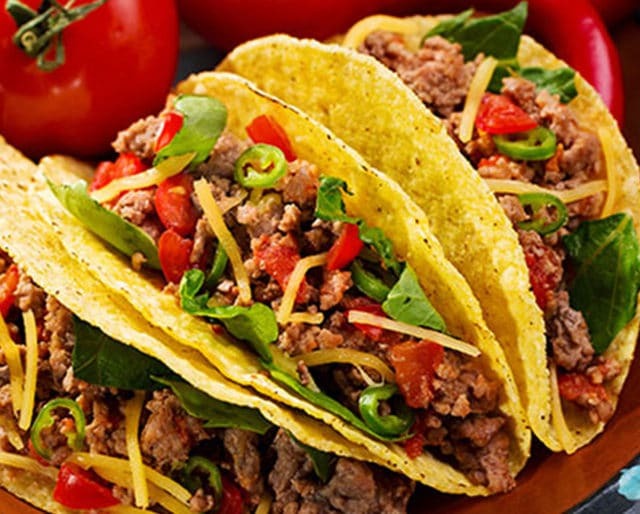 Imagine a fresh batch of hot, spicy, cheesy, meaty, seasoned to perfection, sour creamy, guacamole-y, crunchy tacos with a variety of salsas on the side. Check your pulse if that doesn't sound like paradise to you. Need I say more?